I remember when my sister-in-law, Trisha in fact, had her very first. It was the first grandbaby on our side and we were all BEYOND thrilled. Mom picked us up early from school in our trusty minivan and we high tailed it over to the Ogden hospital, even though it was a blizzard outside and we were sliding all over the freeway. Whatever it took to hold that fresh, brand spankin’ new baby. Most of us were still so little at the time and Trisha was so patient with us. Now that I’m a new mom (and in the winter season) I think back and wonder how in the world Trisha handled all of us kids bombarding and overwhelming her new little one. I know it’s totally normal to be completely paranoid with your first child so I don’t beat myself up over it and just hope that people will understand why I’m acting like an overprotective, hand-sanitizing nazi. 😉 I really haven’t run into too many problems. Both mine and my husband’s family have been really helpful, respectful, and sensitive to our wishes, (no matter how absurd they may sound). 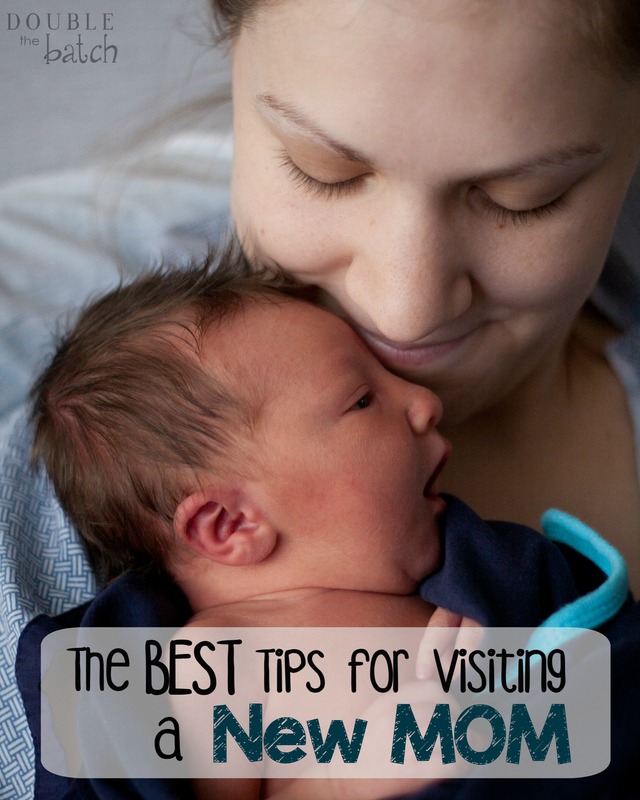 In fact, because of how wonderful our experience has been, I’ve come up with some tips for those who might be wondering what is appropriate when visiting a new mom. First and foremost: ALWAYS ASK TO VISIT. Don’t ever show up unannounced. There’s this new found fear in a new mom who hears a knock at her door that she isn’t expecting. Especially since a new mom’s schedule mostly involves nursing and sleeping. (Trust me… you don’t want to interrupt either one of those if you wanna stay on mama’s good side.) Don’t get me wrong. A new mom LOVES company, especially when most of her day consists of baby-talk and diapers, but giving her a simple heads-up of a visit is extremely appreciated. -Hold off bringing your own kids when you visit. Not that we don’t love children because . . . obviously we do, but having your child run all over the house, and constantly ask to hold the baby is nerve wracking for a new mom. -Don’t make her ask you to wash your hands or use hand-sanitizer. I mean, it’s not that big of a deal but it does feels awkward sometimes having to continually ask. Also, just because you’ve washed your hands doesn’t mean you are now free to touch all over the babies hands and face. Unless you KNOW mom is comfortable with that, let’s just hold the baby and leave it at that. – Offering to pick something up for them (a snack, a meal, etc.) on the way is never a bad move. I was so lightheaded for a month after the baby was born that I could barely walk into the other room without feeling like I would pass out, let alone stand long enough to make a meal for my family. I always appreciated it when people brought food with them. -Offer to hold baby so she can shower or go out and pick stuff up herself. As much as we love that little human being we created, being cooped up in the house 24/7 (especially in the winter) can be really hard. Throw in those crazy post-partum hormones, and she may need a little break. I loved when people would pick stuff up for me but there were times when I loved even more being able to go get those things myself. -Whether you believe it’s contagious or not, a small sniffle or beginnings of a sore throat is just enough reason to stay away as a full blown cold is to a new mom. This includes if you’re living with anyone who is sick. Just don’t risk it. Steer clear until you’re 100%. -If you’re family or close friends, her house will most likely be a mess when you come over to visit. Is she embarrassed by it? Most likely. Will she ask you to help clean it? Heavens no! Will she be forever grateful if you helped anyway? Yes yes yes! (at least in my case). My best friend and my siblings from both sides of our family helped tidy up a little whenever they were over (even washing dishes AND vacuuming, bless their hearts.). I was so embarrassed by it but SO GRATEFUL for their help when I was too weak in those first couple weeks to maintain it myself. Don’t worry if you’ve unknowingly done a few of these. How can you resist that distinct newborn scent and not want to hold and squeeze that perfect little human being. I know I can’t! Hopefully by following these tips, both you, baby, and new mama will have a healthier and more enjoyable experience. Any other tips you mama’s out there would add?